You know you’re a bad parent when your teenagers beg you to stop ordering pizza and cook something. It was one of those weeks; I was sick (and tired) and the will to eat, nevermind cook, was gone. But, by Friday I realized my kids had consumed enough sodium and bad mozzarella to warrant an intervention from the Children’s Aid Society. I’ve always admired Nigella Lawson because she can cook an appetizer, a main and dessert without getting a single stain on her form-fitting sweater (Not that I was looking), but I am not often inspired to make her recipes. This dish is the exception that proves the rule. It is my number-one go to meal when I do not feel like being in the kitchen. 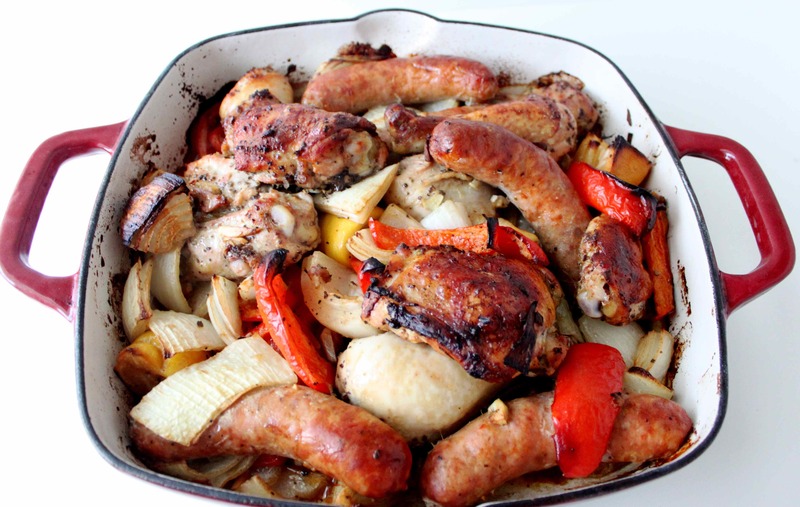 Chicken in a simple marinade, sausage (pick your favourite I usually use Italian), onions and sweet red pepper baked together with sage and garlic and served family style straight from the oven. I roast a few potatoes on the side or serve it with rice or couscous. It is delicious every time, but I’ve never managed to do make it without getting my shirt dirty. Combine oil, garlic, sage, mustard, Worcestershire sauce, salt and pepper. Squeeze in lemon juice and mix well. In a large resealable bag or bowl, combine marinade with chicken, onions and peppers. Toss the lemon quarters in as well. Marinate for at least two and up to eight hours. Pour contents in a roasting pan and add sausage. Bake for 1 1/4 hours. Serve in the pan.